A dating service for single Christians aimed at serious faith-based relationship. Once you join, you can chat online with others who share your beliefs and values. ChristianMingle is one of the most active online Christian communities and has around 39,000 regular members. Looking for a Christian Relationship? 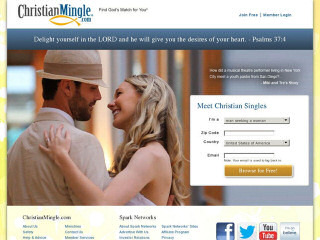 Relationships.com, now known as ChristianMingle.com is a lively Christian dating and contact site. It is a member of the Sparks network, which also includes blacksingles.com and spark.com. They have an easy to use website which is pretty self explanatory to navigate. ChristianMingle claims to be the leading Christian relationship site. Backing this up there is an extensive list of testimonials from happy users who have met their soulmate through relationships.com. They give credit to the site for marriages, engagements and babies!A profile needs to be created to get in-depth information on the singles listed within the site. A quick photo search is available, but you can only pick a ten year age span of men or women. You can browse through two pages of thumbnail photos, but no details are given on the person. To have a smaller search, make your profile and click away. The site has thousands of members, but no specific number given. With the amount of testimonials listed, they have much success in the matchmaking department. This website offers lots of resources for people in the dating arena. Rss Feeds. Subscribe to comments for this site. [?] Receive updates about Christianmingle.com directly through your newsreader. Cant believe this site gets 4 stars from some people, my guess is those are promotional insider reviews. This site is chock full of fake profiles, it is so frustrating ... I spent about $600 and not one date. Would have checked out much sooner but I really wanted to meet a Christian and there aren't many Christian dating site competing with ChristianMingle that are worth trying. I now continue get fake profiles saying that they are interested, to entice me to come back. So now I noticed they are still using my profile even though I quit ChristianMingle. I have spoken with a few potential dates, on the phone and those fall flat. I have had way more dates on Bumble and FitnessSingles and even some on OKC. I have 4 dates coming up this week. Just need one match though. The differences is, I am getting out there. I AM optimistic there will a match in this next batch of dates. NOT from ChristianMingle. Read: They were a TOTAL waste of money! Yes, there are Christians on these other sites too! Was a member 4 months. Not enough interesting women in my area to make it worthwhile. Otherwise it is good enough. It is writen that he who finds a wife, finds good things and favour from lord. I believe that my God sent love, and will locate me this month. ChristianMingle.com 3 3 A review of ChristianMingle.com. A dating service for single Christians aimed at serious faith-based relationship. Once you join, you can chat online with others who share your beliefs and values.